There has been a vacation in this month. I drove to Virginia to spend time with Carole and Larry. 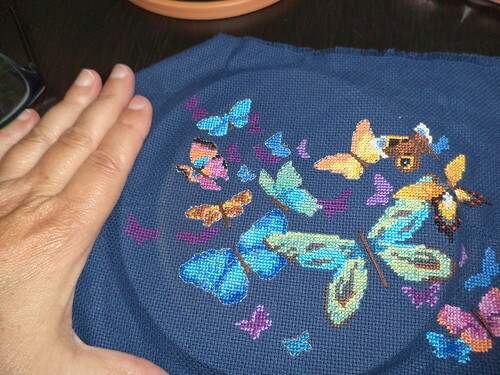 With all the other things going on in life, I didn't have time to finish the butterfly cross-stitch before I left. I was down to just a corner and the outlining. But the whole point of a vacation is to be leisurely or, at the very least, do things you want to do. One of those was finish the cross-stitch. 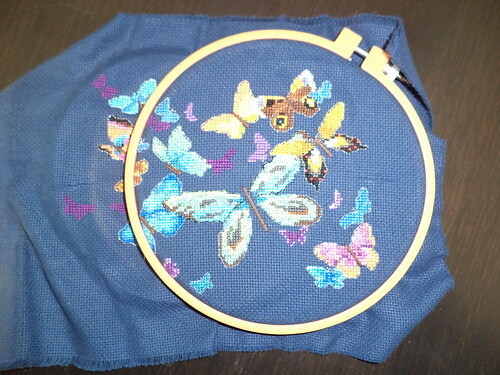 First, I finished the last four butterflies in the lower right corner. Then I started the outlining. I've made some modification in the instructions as I've worked. What I like about the design is the mixing of the colors. Completed, it's like a water-color. The primary outline color is silver thread. The big butterfly in the center is partially outlined in black. 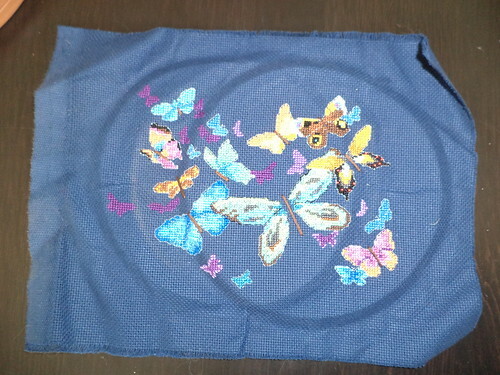 Not all the the butterflies get outlined, either, which I think lends to the wispy-ness of the design. The silver added just the right touch, but there was also the matter of all the backspacing within each wing. I opted not to do that. I felt the additional silver would detract from the butterflies and I wanted them to be the primary focus. It's hard to see the black outline around the top wings of the big butterfly, but it's there. The other thing I didn't do was add the dark brown box around the outside. I felt that seriously detracted from the design and was very unnecessary. The piece also is not "signed", as I usually sign things. I couldn't decide where to put my signature, "DM [year]", where it wouldn't detract from the design. Carole said signing it wasn't necessary. She knew who had done it and would tell anyone who asked. I hand washed the piece for her and left it. She can frame it however she likes. With that done, I'm going to the sewing machine for my next projects, but there is a trip to JoAnn Fabrics next weekend before I sit down to sew. The outlining adds a bit of emphasis on the butterflies. It looks fine as you have done it and I am sure Carole will be delighted!